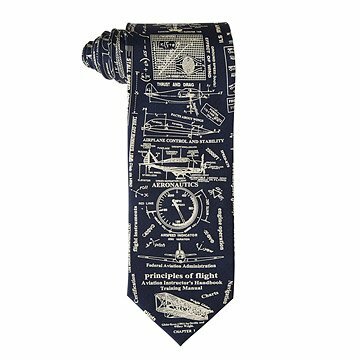 Soar into your next meeting with this silk tie that sports sharp graphics related to aviation. It was a birthday gift for my son who works as a engineer at Boeing Aircraft. I thought it would be a perfect extra gift for him. He loved the tie. He is usually very honest and I would know if he was not crazy about it the tie. I actually purchased another for my other son who works for United Airlines and he loved it. I like giving gifts that you don't see everywhere and that are unique and made well. I love your website and when I am looking for a gift I usually first try you. My husband works for the US Air Force and used to work on aircraft. He loves planes and was thrilled with this unique tie to wear to his office. Very nice quality, and present was a hit! Perfect Present for a Pilot! I bought this for my pilot dad. He loves it! I'm not sure he'll wear it, given the width. What a great gift for a pilot! Although my son will be in uniform when he flies, this will make a great conversation starter when going out with friends! This tie is well made and has a unique design.